In frames of the Week of Germany 2016 in St.Petersburg ARTS4CITY has organized a lecture and a workshop on prototyping urban infrastructure. The events were supported by Friedrich-Ebert Foundation in St. Petersburg, German Consulate General and Center for German and European Studies. Bicyclope project. i collective and Zuloark, Berlin. Quality of the infrastructure in public spaces is crucial for livability of the latter. Collectives of artists, architects and designers together with social researchers see public infrastructure as their object in many European cities. Their experience shows that well-designed public infrastructure enables interesting and meaningful leisure, public communication and good mood for people in the city and makes atmosphere of shared spaces more lively. Better design of the public infrastructure is variable, sustainable and open-coded. Proposed workshop and seminar spotlight concepts and tools of free urban culture and good public infrastructure: “do it yourself” and “do it together” approaches, open access to prototypes, use of cheap recyclable materials, artistic re-making of daily objects. The seminar and the workshop will benefit students of architecture, design, sociology, urban studies, and those actively interested in the topic. April 14th City tour with invited artists and selected participants of the workshop in the ‘Posadsky’ municipal district of St.Petersburg and Tovstonogov square, where one of the prototypes designed during the workshop will be constructed in real. Juan Chacon, Zuloark (Berlin) and Natalia Hosie, i collective (Berlin). Location: Taiga, Dvortsovaya embankment, 20. 25 young architects, designers, urbanists and sociologists, chosen by an open call , took part in the workshop. Workshop was guided by Juan Chacon and Natalia Hosie. Participants united in 4 multidisciplinary groups created prototypes of urban infrastructure for the Tovstonogov square. The Tovstonogov square is placed in the historical area of St.Petersburg, and in fact is a spacious courtyard given a status of a square. 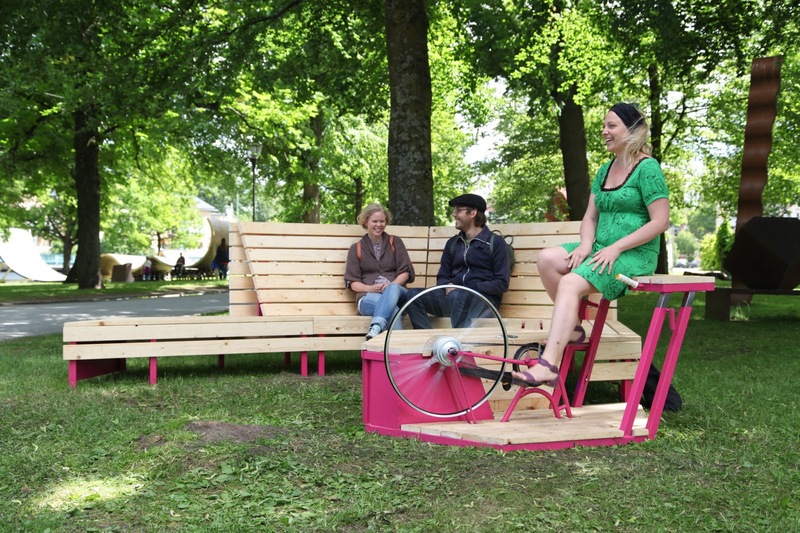 The partners of the workshop – municipality of the local district – appointed the square as a place for experiments. Location: “Klass Truda” workshop, Gazovaya street, 10.